"Yo. Welcome to Quito, bro." The bed shook back and forth, jolting us out of a deep sleep on our first night in Quito. I thought Rolando was shaking the bed to get back at me for tossing and turning. Being Guatemalan, he knew instantly that it was an earthquake… while on the 9th floor of our Quito apartment. Suffice it to say we slept in our day clothes that night, with an emergency backpack ready to go. Check! I’ve crossed living through an earthquake right off my bucket list. In all seriousness, the quake was only a 4.6 on the Richter scale, a minor shake that caused little damage. But it was quite a scare! Earthquakes are a regular occurrence in Ecuador—the country just experienced a major one a few months ago which leveled a coastal city. The one we experienced was small but still gave us an unforgettable, uniquely Ecuadorian welcome. As we thought about how to capture our travels with followers of the blog and Facebook site, we decided we wanted to make it a fun and quick read. So, instead of a long journal entry or a play-by-play of each place we visit, we’ll share the "Art of Wanderlust Wanderlist" —a list of the most most memorable, unique, or outright weird experiences we've had in each location. We absolutely loved Quito. We were lucky that Rolando’s friend Diego gave us a place to stay with his family, all of whom were unbelievably warm and welcoming. We feel very grateful toward the Espinosas for making our first days unforgettable. A bit about the country: Ecuador is a South American country whose geography separates it into three distinct parts: the third to the East is the coastal region, the third furthest west is the Amazon, and the central portion (where Quito is located) is known as the highlands. As the name suggests, Ecuador is located on the equator. One of the major tourist attractions in the country is Ciudad Mitad de Mundo (City at the Middle of the World). This is a large tourist park with several attractions, the most important of which is the purported equator—a bright yellow line painted across the park. It’s at this spot where you can take a selfie with one foot in the Northern hemisphere and one in the South—one foot in Summer the other in Winter. We took LOTS of pics (as you might imagine if you know Rolando). All that said, we heard through several sources that recent, more accurate experiments found the real Equator doesn’t actually exist there… the real equator is a nudge to the left, about 300m outside the park with a line painted inside a different museum. The REAL equator museum had unfortunately closed by the time we got there… but don’t you worry, we walked our OCD butts halfway around the museum to make sure we crossed the real equator at least once. Quito has a mountainous terrain and is surrounded by several volcanoes. The one with the funniest name, the Pichinche, has a cable car system called the Teleferiqo, which hauls visitors up to see the beautiful views. Quito itself is about 3000m above sea level (the second highest capital city in the world), but it wasn’t until we reached the top of the mountain at 4100m that we began to feel altitude sickness. Hiking made us feel out of shape, which is probably some combination of the altitude and the bucket of empanadas we’d eaten the day before. 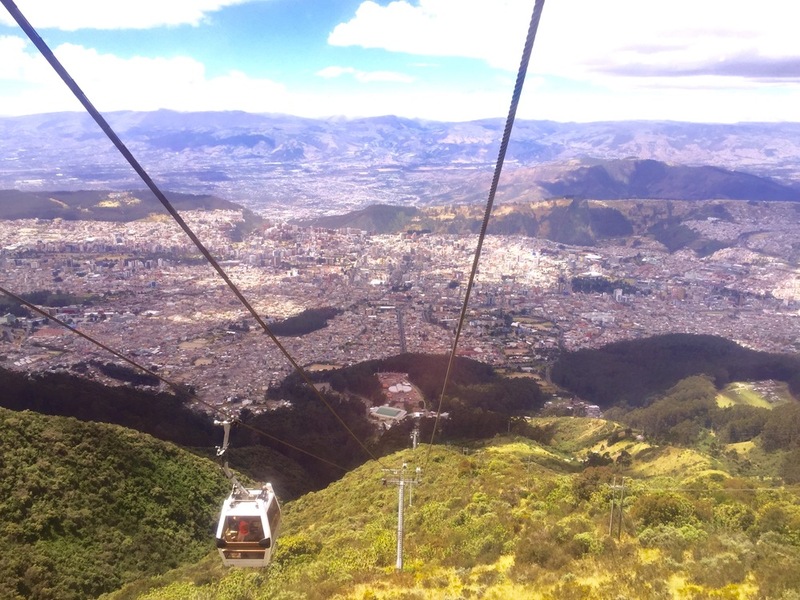 At the top of the mountain were several hiking paths which led to beautiful views of Quito. We savored the views and a couple cappuccinos, made some hairy friends (see pic above), and then headed back down the mountain to experience more of Quito. With elaborate churches and beautiful architecture dating back to the 1500’s, Centro Historico (Old Town) is a must-see place when visiting Quito. We spent our first day walking through the central squares which reminded us a great deal of Antigua, Guatemala. It was a great introduction to the city which was founded by the Spaniards in 1534 and soon became a cultural hub. Just a short cab ride from Old Town, up a steep and winding road, is a 40m tall sculpture of an freakin' angel with a dragon (take that Pokemon) that guards the hilltop overlooking Quito. Not only is the sculpture breathtaking, but the view of Old Town from the top of the hill is an amazing sight. Café Vista Hermosa, aka Beautiful View Café (are you noticing a trend here? Yes, lots of beautiful views), is located in the heart of Old Town. Just up a rickety, old-timey elevator awaits the charming restaurant and cafe. We had some coffee from the rooftop and enjoyed the beautiful scenery: the colorful architecture, the rolling hills, and a prime view of Panecillo and the Presidential Palace. Our last stop on the first day of touring Quito was La Ronda, a historic alley known for its bohemian shops, artists, and cafes. After perusing the art shops we sat down at a café to try a local drink that came highly recommended by Diego: Vino Hervido (Boiled Wine). Red wine is boiled with juices and spices, then served warm for a cozy, comforting beverage. Quito stays at around 65º F year-round. This makes it warm in the sun, and cool in the breeze. As we sat up on the rooftop that evening watching the sunset, a warm wine which drank more like a cider, was spot on—the perfect cap to a busy day. That’s all for now! We’re on our way to Baños, the adventure capital of Ecuador. A very big thank you to Diego and the Espinosa family who took us in. Your hospitality and friendship were deeply appreciated! Thank you for reading! Don’t forget to sign up for email updates and to like our Facebook page, if you haven’t already. You can also follow Rolando on Instagram or Twitter for the more photos and updates.